Charlotte is four years old today. Like most parents I wonder where the time has gone. She has grown into a very kind, funny, confident, cheeky and clever girl. I love her company and am secretly glad that she is not starting school until this time next year. We had a little tea party to celebrate her birthday at the weekend. Thankfully after some truly amazing (and by that I mean terrible) summer weather, the sun came out and we had a really great afternoon. That is until she had a complete melt down in the middle of the garden when she didn’t win an egg and spoon race between her and a friend once everyone had gone home! I’ve blamed it on all the sweets she had eaten that afternoon. For her birthday this year she has received load of princess and fairy related stuff, which has pleased her no end. 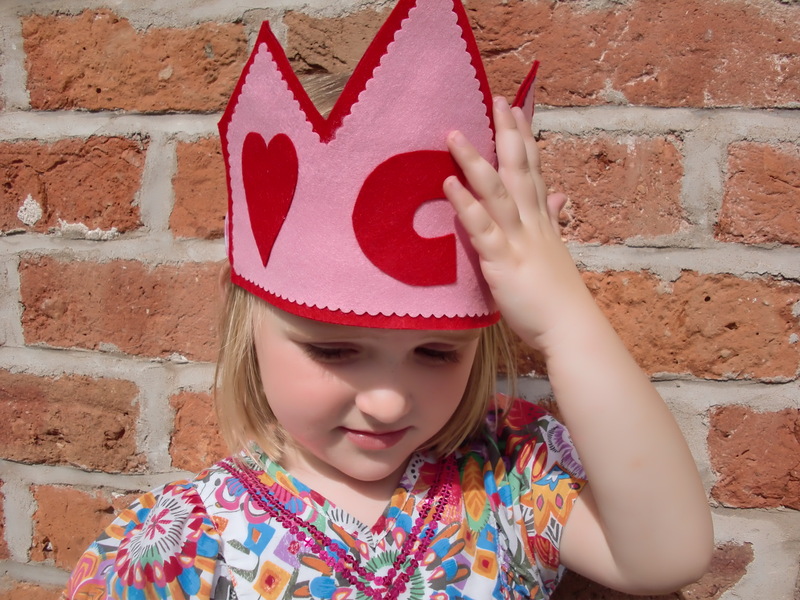 Where I can, I like to make a gift for the girls for their birthdays, so for Charlotte this year I have made her a red and pink heart felt birthday crown and matching wand. What do you think of the crown? Charlotte loves it and has hardly taken it off. I’m so relieved when I’ve made her something and she loves it! If I’m honest with you this is actually the second crown I made her. Crown number one was of a flower design, but I had a terrible glue disaster and it looked pretty awful. Having said that Charlotte seems to love it as much as the heart version….one for the dressing up box!